Click Here for Pricing on Amazon! When finding an instrument to learn to play, one is often drawn to ukuleles. The bright, vibrant sound emanating from its small shape is certainly one of its most attractive attributes. Also, it offers a very cheerful pitch sure to create smiles when strummed. The Donner Concert Ukulele is great for beginners and professionals alike, and it offers those tropical tones that everyone knows and loves. Looking for the right instrument can be difficult because there are so many different choices of wood. Also, not all instruments are made for all levels of players. 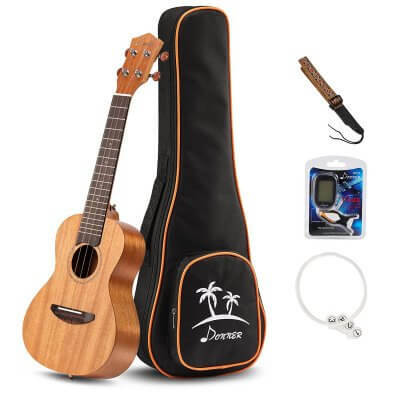 The Donner Concert Ukulele is ideal because it offers a mahogany body and four carbon nylon strings. This particular model also has a beautiful bridge and fretboard made of rosewood. The fretboard wood choice is more for aesthetics and comfort. 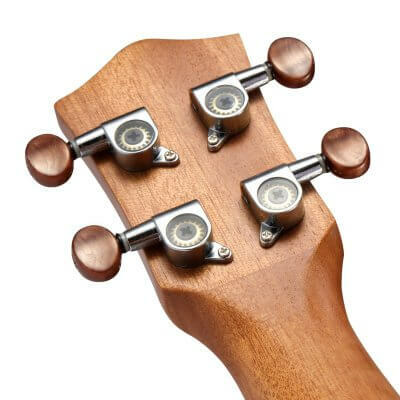 However, the bridge’s use of rosewood is for increasing the tone’s richness and pitch range. Maintenance for this particular model is also small and quite manageable, making it ideal for those trying to get into playing. Finding an instrument that provides the exact tones you want can be difficult. You have to worry about what makes up the body of the instrument, the size, and the overall quality. Because this model’s strings are softer and easier to play, the music is sharper and clearer than what you can create with others. It’s also less likely to make your fingers hurt while playing, meaning that you can practice for longer. Also, the usage of mahogany gives the traditional tropical tones and feel typically heard with this instrument. Lastly, its medium size is ideal for players trying to create those higher sounds for the optimal performance of their songs. Donner Concert Ukulele is a great purchase because it’s incredibly versatile. Early beginners and trained professionals both choose it because of its simplicity. Along the neck, there are fret position marks to help you see where certain frets are located more quickly while playing. Fret marks are also especially helpful to those using tabs, which are a very popular and simplified form of sheet music. Because it works well with tabs, the beginning user can more easily improve their skills and learn to play faster. Another huge bonus to having frets marked and being able to use tabs with it is that there are many free resources for tabs online. You can find complete notes for songs and albums online to practice. With new players, this is incredibly helpful because you get to play something you’re actually interested in instead of something you’re told to learn. This also helps to eliminate the need for private music lessons and tutors. Furthermore, this particular model is simple to carry around, which means you can perform anytime, anywhere. So, feel free to lay your case on the ground in the park and get playing for some spare change! Realistically, this is a very good buy. Its composition is classically made, and it offers everything one would find in a standard purchase of such an instrument. With an unrivaled ease of use, a new player wouldn’t feel overwhelmed and give up on learning. However, this instrument is also made at a standard high enough for professional performers of all calibers. The only downside to it, really, is that beginners may have a tough time restringing it at first. With plenty of practice, this would be no problem, though. There are many resources online to help with such a task, too. Overall, this instrument has a lot to offer whether you’re a budding musician or if you are already proficient in this art. With its ease of use and fun, quirky nature, you’re sure to have a good time playing and learning the ins and outs of such an instrument. It’s a highly recommended model with a lot of songs to make. The ukulele is a perfect fit for the beginner and the expert musician alike. So, we started this website for long-time fans of the uke as well as those who want to learn more about it. We want to inspire others to pick up this instrument and to learn about its rich history. 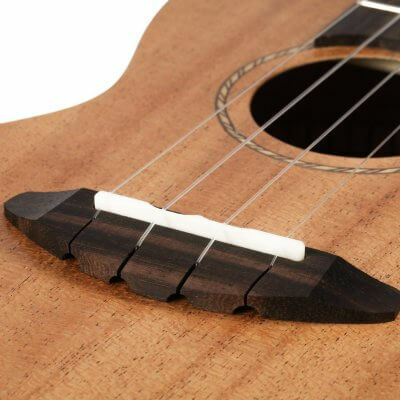 On our site you will find many articles, reviews, and other media all exploring the wide world of the ukulele.